It's mid-week once again and Christmas is almost near!!! Do you have a list on what to spend with your Christmas Bonus? My answer is baby-related stuff! Anything for Baby AMW of course! While you are still thinking about your "Christmas Wish List", I will be sharing a review on a unique product called Laneige Snow BB Soothing Cushion. As much as I would love to test this outside, the shade I got for review isn't right but for the sake of review, I only tried this out "indoors". Laneige came up with the Snow BB Lines featuring Snow BB Cream (cream), Snow BB Balm (Balm) and Snow BB Soothing Cushion (emulsion). The latter is what I will be featuring! Laneige Snow BB Soothing Cushion is formulated with White Plus Renew Complex, the patented ingredient of Laneige White Plus Renew skin care line that inhibits melanin production and promotes a brighter complexion. Powerful sunscreen protection of SPF50+ PA+++ added to maintain your skin tone and prevent skin damage from UVA and UVB rays. With its lightweight, emulsion formulation packaged in a convenient compact, applying BB Soothing Cushion is a breeze. It's more than 30% moisture and mineral water content help to calm overheated skin, and provides a cooling sensation for hot and humid temperatures like ours. The formula resists sweat and sebum, making it long-lasting. Laneige sells refill so it helps save the environment and your money. Good quality sponge that comes with the packaging. None drying and doesn't cause my skin to flake. Long lasting, the product stays on my skin even after 8 hours. Comes in 4 shades which are good enough as most BB products come in 1 or 2 shades max! The sponge could get a bit messy after first use. The high SPF could create white cast on flash photography. The Laneige Snow BB Soothing Cushion is a unique product with a unique look! This product is very easy to apply as you don't need your fingers to blend the product. The effect is very fresh and natural and the best part, the coverage is long lasting. For light coverage, gently apply the Snow BB Soothing Cushion using the sponge with a circular motion. For medium coverage, apply the product with a patting motion using the same sponge that comes with the product. For girls who prefer moisture, go for Snow BB Cream. For girls who want a matte-finish, pick Snow BB Balm. Do I have to remind you again? Wash sponge upon purchase and clean your sponge at least once a week to prevent bacteria build-up! You can also use other tools for application, apply BB Soothing Cushion with the sponge and blend with your clean fingers or foundation brush. If you suffer from oily skin, the product would work better if you set it with an oil-control powder. If you suffer from dry skin (like me), you can use the product on its own. For light-weight makeup application, cover spots like under eye circles or acne marks with concealer and set with powder. 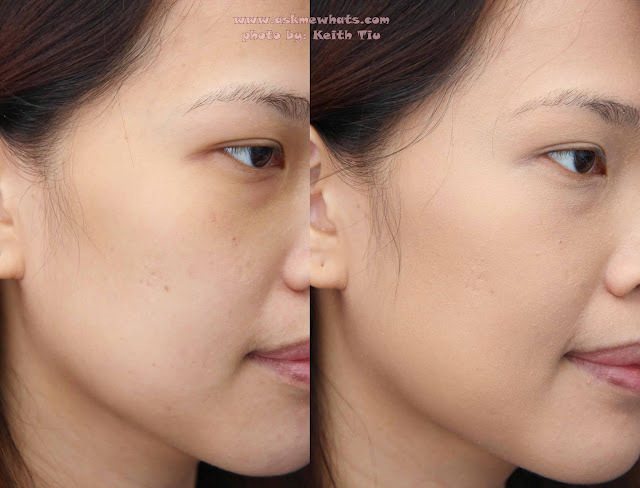 Skipping liquid/cream foundation will cut your makeup application in half! Yes! But this time, in my own shade which is 21. Shade 23 would work well for MAC NC35-40. The Snow BB Soothing Cushion would work well on people with normal, oily, combination skin who likes not only the coverage but the whitening and sun protection. Very oily and super dry skinned individuals may need the extra help of moisturizer or oil-control primer underneath. with clear mirror and very thin sponge. The BB Emulsion is absorbed inside the sponge. The shade I got to test is in Shade 23 Sand Beige. This shade would work well on girls and boys with medium skin tone. To grab the product, use the sponge and gently press the cushion for product to come out. Gently press for lighter coverage and press a bit more for medium to heavy coverage. Since my skin is dry and flaky, I prefer to use the "patting" motion and it gives me more coverage so I can get away using only this product and set with a translucent powder if needed. You can put back the sponge on the plastic "separator" for storage. As stated on my "con" above, the sponge could get messy. Left: Under eye darkness, some tiny red spots on the cheek area. Right: Under eye darkness reduced and the red spots were covered! AMW with no makeup on except Laneige Snow BB Soothing Cushion in Shade 23 Sand Beige. The coverage and effect was great even Mr. AMW (who took this photo) complimented on how even my skin looks! Have you tried any Laneige products? How was your experience with the brand? This is my second Laneige product that I've tried and so far, both experiences were good! (Read my past review on Laneige Water Sleeping Pack EX HERE). OMG! I need this stuff in my life! I was waiting for this review Nikki! Thanx a lot for sharing your opinion! Nice, I've only tried this with foundation brush and like like like naman! sayang lang the shade doesn't match but would give 21 a try! I love the coverage! Join my FOREVER YOUNG ACCESSORIES GIVEAWAY and win awesome prizes! hahah thanks Issa, you're super nice to me! :D have a great day! Hi, if you are referring to the white sponge applicator, you can still wash it but do not expect the stain to be removed, it will stay there but at least you know that you got your sponge washed at least once a week. One alternative way is to put a bit of extra virgin olive oil on your cleansing liquid for the stain to be further removed. It works but you have to wash the sponge well for it not to be too oily, keep in mind to put only a few of the Extra Virgin Olive Oil! If im nc20-25 which laneige bb cushion suits me?